High–efficiency systems are engineered and installed to deliver more comfort, better moisture control, improved indoor air quality, and quieter operation. 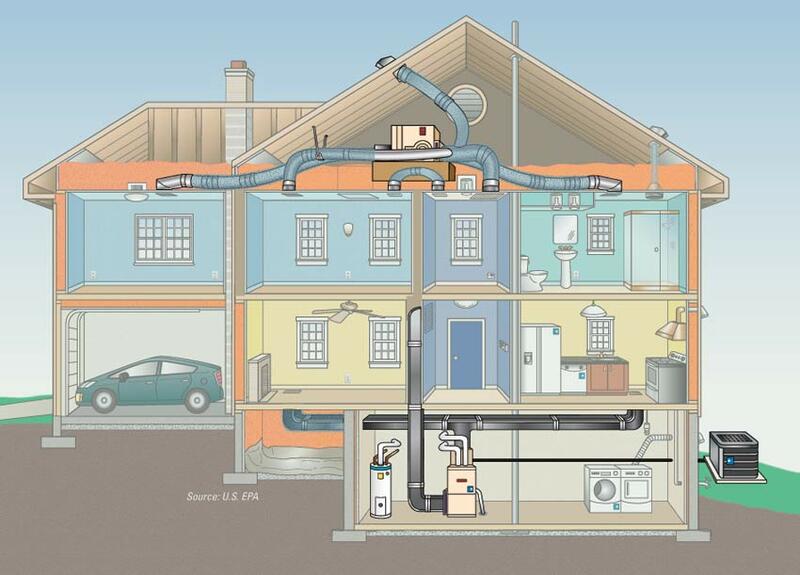 Learn more about a complete heating and cooling system in this fact sheet (PDF, 1.83MB). The heating and cooling systems in ENERGY STAR certified homes and apartments are designed and installed in accordance with industry-accepted best practices and subject to independent review and inspection. The living space in ENERGY STAR certified homes and apartments are served by ventilation systems that continuously exchange indoor air with outdoor air to reduce the indoor air pollutants in your home. Systems are also installed in bathrooms and kitchens to more rapidly remove moisture and cooking contaminants that can be harmful to occupant health and to the durability of your home. * Applies to installation of ventilating systems and the most common types of heating and cooling systems in new homes and apartments. Every ENERGY STAR certified home and apartment is built with the following features. Ask your builder or leasing agent for more information.